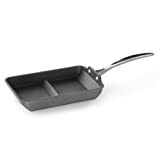 If you love omelets, but have trouble making them, then check out this cool new Nordic Ware Rolled Omelette Pan. Just pour egg batter into one half, tilt it to spread it to the second half, use the center divider as a guide when you add cheese, vegetables, and seasonings, and then simply fold it over with the spatula and roll it out onto your plate. In the end, you will have a perfect, tightly rolled omelet without all the fuss.